In spite of the negative economic situation that has recently characterised the Euro currency countries, the luxury superyacht market continues to be dynamic, achieving absolutely notable and growing market performances in the last few shipbuilding years. A few figures may illustrate the extent of the phenomenon: in the course of the 2004-2005 shipbuilding year the overall superyacht market touched record heights with a world order book equal to 651 units and an overall length of 75.996 feet . From certain estimates it appears that during the last shipbuilding year the market has grown for an overall value of $1,22 billion. With regard to this phenomenon it may be helpful to evaluate the overall luxury superyacht industry in terms of market performance with view to drawing up an overall picture of market evolution. In this context, figure 1 shows the evolutional progress of the order book over the last 3 shipbuilding years, precisely the years in which the entire superyacht market experienced an average annual growth of 10%, with increasing annual growth rates that led in the current year to a growth of 28.40%. Important indicators then, especially in consideration of a world economic situation that is hesitating to take off, which denote how the luxury yacht segment is an increasingly attractive business. With view to evaluating the market performances of the superyacht industry it is important to analyse, over and above the evolutional trend of the whole order book, the market share among the various shipbuilding industries/countries. Figure 2 illustrates the market shares of the main international shipbuilding industries during 2004-2005 and their evolutional trend. The first thing to underline is the considerable concentration of the market: in fact the first 5 countries (Italy, the United States, The Netherlands, the UK and France) represent overall the biggest share. From the analysis carried out it emerged that the motor superyacht sector has a concentration of 73% as against the 60% of the sail superyacht market. Though the values are high (see figure 3), the degree of concentration of supply on the part of the main industries/countries is in slight decline (-1,3%). This fact, compared with the performances of past years, is a sign of an increasing competitive ability on the part of shipbuilding industries in countries which until not long ago could be defined as "of little importance". In comparing the overall market share by macro segments of the superyacht market it emerges that the Italian shipbuilding industry is market leader in the motor superyacht market (40%) while the Dutch industry holds the same position on the sailing superyacht market (24%). With regard to the Italian industry, various aspects must be considered with reference to the last shipbuilding year. First of all, the total share of the superyacht market has grown by 3%. Moreover, with reference only to motor superyachts, in spite of a 33% increase in the order book (in terms of units produced), at overall level the market share has not undergone variations. 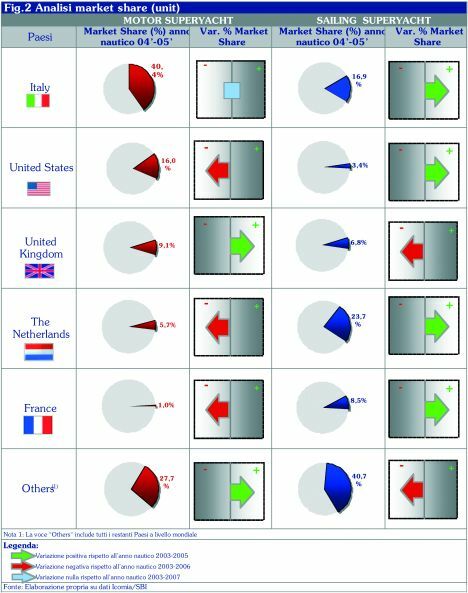 (Among the main countries the only one with a positive variation in market share is the United Kingdom whose order book more than doubled in 2004-2005). If on the other hand we consider only the sail superyacht market, this has grown with a share of 17%, confirmation of the continuing high competitiveness of Italian yards also in the building and marketing of custom sailing superyachts. Superyacht market performances were analysed under another aspect by considering, in terms of international ranking, the first 3 industries/countries for the respective business macro segments (see figure 4). 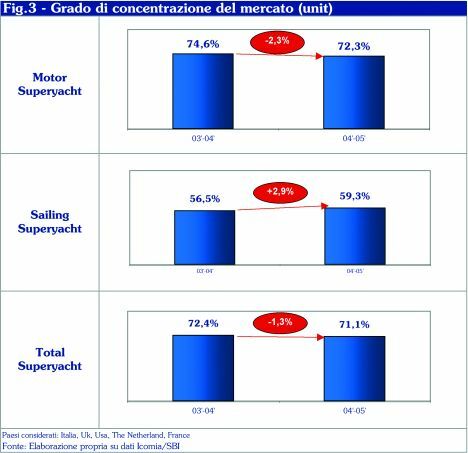 In the macro segment of motor superyachts Italian yards hold first position in the various business micro segments in terms of length range. Only in custom motor superyachts does Italy share market leadership with Dutch yards. In the 80-90 foot motor superyacht segment, Italy is joined by Industries/Countries such as the UK and the USA. This notwithstanding, the eye is caught by the numerical gap existing between Italy and the remaining countries (105 units as against 44 in the 80-89 foot segment, and 111 units as against 38 in the 100-149 foot segment). In the upper 100-149 foot micro segment, as well as the USA there are, in third place, Chinese shipyards which, according to some estimates, have considerable positioning in the business micro segment (expressed in terms of boat shape) of expedition yachts. (Surveys point out that in 2004-2005 almost 25% of the entire world portfolio of expedition yachts are being built in Chinese shipyards). In the custom motor superyacht business the outstanding producers, apart from Italy and The Netherlands, are the USA and Germany. But there are also important indicators in the sailing yacht sector. In fact on the sailing superyacht market Italian shipbuilding industries occupy first positioning in the upper segment, which is to say the segment of custom sailing superyachts. The United Kingdom is leader in the 80-99 foot segment while the Netherlands holds the same position in the next segment of 100-149 foot sailing yachts. Unlike the motor superyacht sector, sailboat market leadership varies from one business micro segment to another, without taking into account that in numerical terms the two business macro segments have order books that cannot be compared (the sailing superyacht sector in fact represents only 9% of the whole market). All these data confirm the dominant position of the Italian shipbuilding industry on the overall superyacht market. This survey of market performances must be completed with analysis of the market share trend of the main shipbuilding industries (see figure 5). In this case too, needless to say, the data are astonishing. In fact it emerges clearly from the analysis that the Italian shipbuilding industry is in continual growth: over the last 4 years it has gone from 33.5% to 38.2%, almost 5 percent in only 3 years. 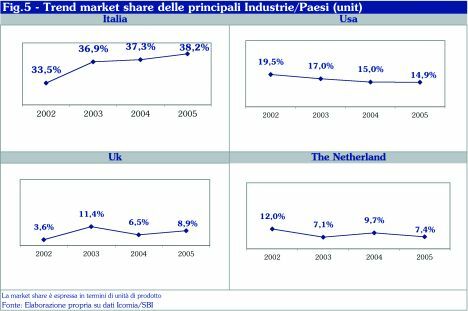 For the 2004-2005 shipbuilding year all the main industries/countries show a diminishing market share, with the exception of the United Kingdom which shows a trend inversion. This diminishment (see The Netherlands and the USA) followed by an overall growth of the whole international order book is certainly the symptom of an increasing level of competitiveness on the luxury vessel market, and is also a result of the entry of new shipbuilding industries from the so called emerging countries. The superyacht market is therefore once more confirmed as a growing one, complex and dynamic, in which Italian shipbuilding industries occupy a position of undisputed leadership. At this point it is legitimate to wonder what the future holds. It will certainly be a future with an increasingly competitive market in which it is no longer enough to have production capacity: on the contrary there will be a need to draw up and position the market offer with view to acquiring advantages over the competition. In recent years various yards have undergone a great number of vicissitudes whereas, this notwithstanding, many others have been able to grow with not inconsiderable economic rhythms. Why do some grow and others grow less in spite of the fact that they are marketing the same typology of product The answer is certainly to be sought in the concept of competitive ability, the only ability that makes one yard stand out from the others in an increasingly varied competitive situation. The gap between effective and potential market is such as to presuppose decisive market growth, but this does not mean that all yards will grow: growth will come only to those that have learnt to develop their competitive skills. This market analysis refers to the shipbuilding year 2004/2005 and this is why there are differences between it and Mr Pollicardo's analysis dealing with 2004 (L'Opinione - page 168).